Triumph Motorcycles will expand its Indian product portfolio with the launch of the new Speed Twin on 24 April. The new model brings the technology, power, and torque of the Thruxton R in a more accessible and modern setup. 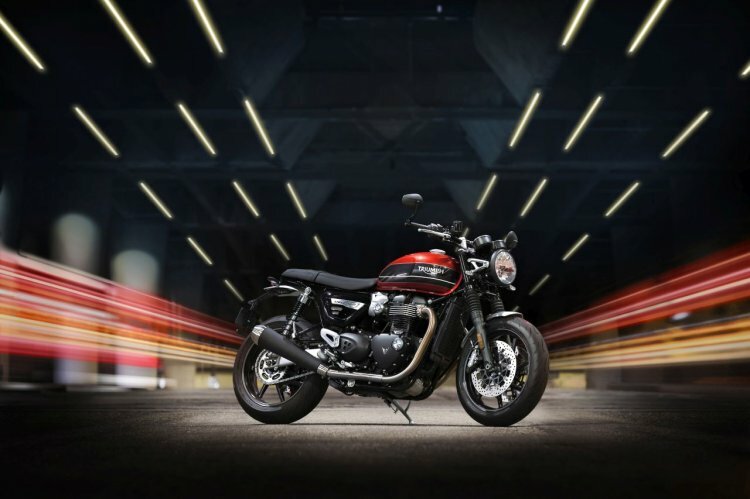 Triumph Motorcycles will launch the 2019 Speed Twin in the Indian market on 24 April. The motorcycle features the power, torque and technology of the Thruxton R.
Styling cues of the Triumph Speed Twin include upswept silencers, 7-spoke cast aluminium wheels wrapped in Pirelli Rosso Corsa 3 tyres, full-LED lighting (headlamp, blinkers and tail light), Monza-style locking fuel cap and bar-end mirrors. The cockpit includes a retro-style twin-pod instrument console that displays odometer, gear position indicator, trip settings, riding mode setting, fuel level, average and current fuel consumption, distance to empty, traction control setting, clock, service indicator, TPMS indicator*, and heated grips* indicator. Shock absorption tasks at the front are performed by cartridge forks, while at the rear, there are twin suspension units with adjustable spring pre-load. Powering the 2019 Triumph Speed Twin is an updated 1,200 cc liquid cooled, 8-valve, SOHC, parallel-twin Bonneville engine with a 270-degree crank angle. This motor churns out 97 PS of max power at 6,750 rpm and 112 Nm of peak torque at 4,950 rpm. The bike has a ride-by-wire system and three riding modes: Sport, Road and Rain. Each mode comes with dedicated throttle maps and traction control settings. Anchoring department includes twin discs at the front with Brembo 4-piston axial callipers and a single disc at the back with 2-piston floating calliper. ABS and switchable traction control come as standard. The closest rivals of the Triumph Speed Twin are the Ducati Scrambler 1100, Kawasaki Z900 RS and the BMW R nineT among others.